When a small Japanese engineering outfit called Dynavector launched the DV505, it rocked the hi-fi world. 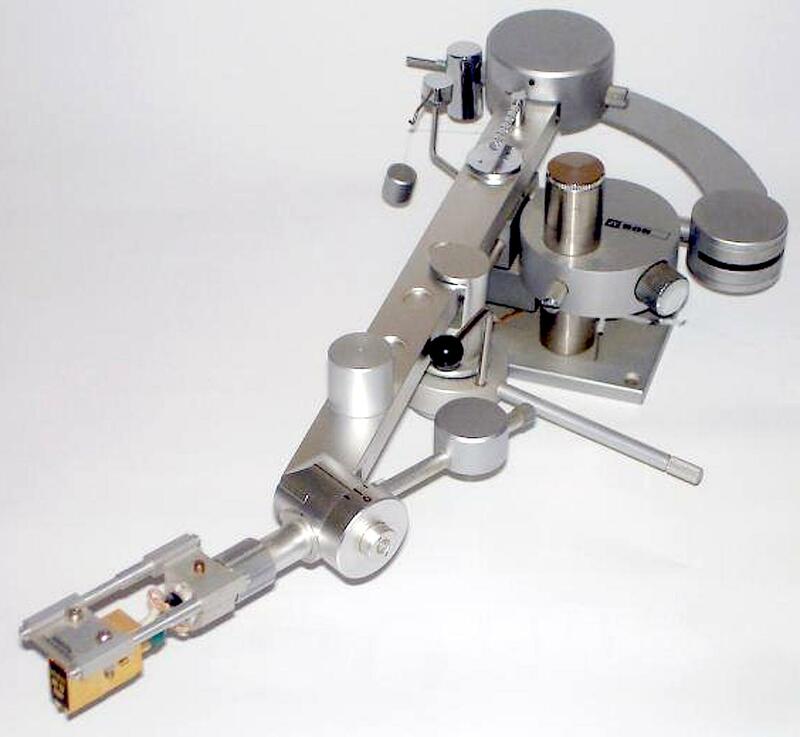 Rather than the usual sales spiel, the company released its extensive engineering research findings into tonearm geometry and resonance characteristics. It didn’t take the world long to sit up and take notice, and the DV505 went on to win 1977’s Design and Engineering Award at C.E.S. Chicago, and then again five years later! Looking at the DV505, you can’t help thinking it’s a work of eccentric genius. The arm’s appearance is striking even today, so what people must have made of it in the mid nineteen seventies is anyone’s guess. With a total length of 335mm and weighing a massive 1.25kg, it was giant. In fact, its proportions prevent it from working properly on most suspended subchassis decks. Even Michell’s gargantuan Orbe is only really happy with arms under a kilo, so what the ‘505 would do to lesser decks doesn’t bear contemplation. In truth, Dynavector had massive unsprung direct drives like Technics’ SP10 in mind when penning its baby. For all its apparent complexity, it is surprisingly easy to mount, with just four screws securing the baseplate. VTA is easily adjustable by means of two knobs, one for sliding the whole arm assembly up and down, the other one for fixing it at a desired position. On an unsuspended deck you can do this even while playing a record. Tracking weight adjustment is dynamic, meaning you level the (sub)arm with a counterweight and adjust it with a spring dial a la SME V. Cartridge weight range is a massive 23g, and like any serious high end design, there’s no finger lift! The DV505’s ‘bi-axis inertia separation’ system had as its goal the separation of horizontal and vertical moving masses. The arm was, basically, two sub arms operating lateral and vertical planes individually. Whereas conventional gimbal designs have one arm that moves in both lateral and vertical directions (making the inertia in both planes equal), the DV505 had very high inertia for lateral operation and very low inertia for vertical operation. It was all about reducing resonance. Conventional tonearms have their vertical and horizontal pivots in close proximity to one another, causing two resonance sources to vibrate at the same frequency, making the resonance greater and much harder to damp. But by separating one pivot remotely from the other, the DV505’s two resonance peaks were smaller, and could thus be damped more accurately. To this end, Dynavector used an elaborate double damping system using both electro-magnetic and inertia controlled dampers. The former applied eddy currents generated from a conductor moving in a magnetic field, and was highly effective at reducing resonances. The second inertia-controlled dynamic damper was incorporated into the main arm, and consisted of a pair carefully matched springs and weights that oscillated only on the horizontal plane as the arm’s main resonance mode occurred. By locating the shorter, lightweight vertical arm at the top of the horizontal arm, a combination of very high mass and good damping in the horizontal plane, and very low equivalent mass in the vertical plane was achieved. This made for superior information retrieval and better groove tracing on warped records respectively – a combination Dynavector said was almost impossible to achieve simultaneously with conventional arms. It sounded superb. At the time of its launch it was surely the best sounding arm around, providing it was properly partnered and set-up. Extremely clean, smooth and open, it was nevertheless impressively musical and dynamic with rock-solid tracking. Moreover, it could be optimised to get the best out of almost any cartridge, and usually did. By modern standards it lacks the Linn Ekos’s punch or the SME V’s detail, but can certainly teach a good mid-price arm like an Ittok LVIII a thing or two. The DV505 was discontinued many years back, to be replaced by the DV507. Visually similar, it’s a smaller, more sensible evolution of the concept and an even better performer. Dynavector is famous for its superb aftercare and servicing facilities, rather like a Japanese SME. The arm isn’t so common in Britain these days, but there are plenty in Germany floating around for about £800, depending on condition. If you’re after an exquisitely esoteric tonearm, this is it.